Beginning of the Advent season - Fr. Vazken explains the importance of taking time to prepare. Thanksgiving, losing the self and the model of the Eucharist are all part of this sermon. 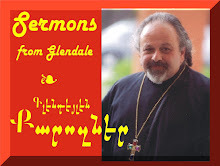 Delivered and recorded LIVE at the St. Peter Armenian Church & Youth Ministries' Center, Glendale, CA on November 18, 2012. "Politics, God & the Kingdom"
Fr. Vazken Movsesian's sermon before election day, talks about the real challenge for the church and the believer. The Kingdom of Heaven and the need to become engaged in thought and principles. In this sermon - the death of a baby, Syria and the Sandy disaster - why evil? Delivered on November 4, 2012 at the St. Peter Armenian Church Youth Ministries Center.